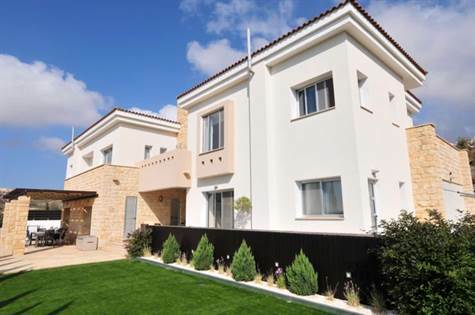 Cyprus Property Blog by Cleo : Modern Villa in Marathounda for Sale - Sea Views, Lovely Plot - NOW SOLD! • 362 sq. m., 4 bath, 5 bdrm 2 story - €849,000 EUR - Bespoke, Custom Designed - NOW SOLD! Marathounda, Paphos, Cyprus - This home is one of three bespoke custom designed properties situated in a peaceful, semi-rural location in Marathounda village with mountain views towards the valley and sea. Paphos town is only five minutes away. The property has been custom designed to suit the individual plot and finished to an exceptionally high standard. This home has neutral, classic finishes with a blend of traditional materials and modern features. The open-plan layout has defined living zones created by the clever use of materials and architectural features. Upon entering the property there is a 2 story foyer with a galleried landing area above allowing light in from the upstairs veranda, giving an airy, spacious feel to the property. The sunken living area encompasses a large sitting area with a modern, marble surround fireplace that is a great focal point. Built-in wenge bookcases provide a nice display area. The dining area is adjacent to this through a feature stone archway. There are 3 large sliding patio doors that lead to the outdoor dining area with stunning sea views. The kitchen is modern with light oak, anthracite units & grey granite work surfaces. The large island is a great informal eating area and provides extra storage. The separate utility room is adjacent to this. The downstairs guest suite features a kitchenette, bathroom and private entrance. Also on this floor is a secondary living area that can be used for a games / TV room, cinema room or a home gym. Upstairs there are 3 large bedrooms. The master being in it's own "wing" with a walk-in closet and large bay window with great views. The home office with external access is also upstairs. The external area is well-designed and private. There are 2 large grassed areas, synthetic turf has been used to provide a low-maintenance alternative to grass & aesthetically looks fantastic. There is an irrigated planting area that features an array of Mediterranean plants.